The Red fort (Lal Qila) at Delhi was built by Shah Jahan on the banks of river Yamuna. The Red fort at Delhi is one of the massive forts in India and is a witness to the heyday of the Mughal Empire. Shah Jahan built the Red fort as the citadel of Shahjahanabad, his new capital at Delhi. The Lal Quila or the Red fort rises above a wide dry moat in the northeast corner of the city of Shahjahanabad. Red fort's walls extend from two kilometers and differ in height from 18 meters on the river side to 33 meters on the city side. Mughal Emperor Shah Jahan started the construction of the Red fort in 1638 and it was completed by 1648. The Red fort contains all the paraphernalia of the Mughal government- halls of public and private audience (Diwan-i-am and Diwan-i-khas), domed and arched marble palaces, plush private apartments, a mosque (Moti Masjid) and richly designed gardens. Though the Red fort had to face the wrath of Nadir Shah in 1739 and the British soldiers during the revolt of 1857, it still remains an impressive testimony to the Mughal splendor and might. The main entrance of the Red fort opens at the Chatta Chowk, a covered street bordered with arched cells that used to house Delhi's most talented jewellers, carpet makers, weavers and goldsmiths. This covered passage was also known as the Meena Bazaar, the shopping centre for the ladies of the court. The Naubat Khana or the Drum House is situated a little away from the Chatta Chowk. The musicians used to play for the emperor from the Naubat Khana and the arrival of princes and royalty was heralded from here. The Red Fort also has the Diwan-i-Am (the Hall of Public Audiences). It was the place where the Emperor would hear complaints of his subjects. In the Diwan-i-Khas (the hall of private audiences) the Emperor held private meetings. This hall is made of marble. The Peacock Throne adorned this hall. It was carried away to Iran by Nadir Shah in 1739. Some other attractions of the Red fort are the Royal Bath or the hammam, the Shahi Burj (Shah Jahan's private working area) and the Moti Masjid or the Pearl Mosque, built by Aurangzeb for his personal use. In the Rang Mahal or the "Palace of Colors" lived the Emperor's wives and mistresses. The Rang Mahal was crowned with gild turrets, skillfully painted and ornamented with a complex assortment of mirrors and a ceiling overlaid with gold and silver. 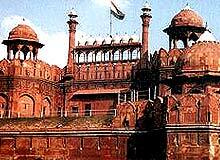 The Red fort of Delhi is an important link between the past and the present i.e. in the past it was a witness to the might and splendor of the great Mughals and in modern times the Prime Minister of India addresses the people on the Independence Day (August 15th).